I just. I can’t right now. This installment of The Others was amazing. I know I’ve been talking about the darkness of the terra indigene’s (others) nature and how they handle things. There’s always limbs flying in these books and I love it! Marked in Flesh kicks it up to a whole new level. Why is that? Because we get to see the Elders! We get to go into the mind of the Elders. For those who have no idea what I’m talking about, the Elders are the biggest, baddest, deadliest of all terra indigene. They make the sharks, wolves, even the Elemental’s look like absolute bunnies compared to their nature. I mean, these are not beings you want to trifle with and with the Human Lives First movement sweeping through the area, the Elders have been whispering, and it’s nothing good for humans. Seriously, I loved that we got to see the Elders. I got chills the first encounter we got from them. Not to mention… they like Wolf cookies! I tell you, those Wolf cookies are the best darn thing this author has written into the storyline. I love that the Wolves go nuts over it but to have a terra indigene that’s so deadly and ferocious being in love with these dog cookies!?! I just can’t. The Elders were awesome! Plus, we got to meet some Elemental’s that we haven’t crossed paths with. Everyone has heard of Meg the Trailblazer and they’re all interested in her. She saves Elemental steeds from peril, risks her life for the terra indigene, and apparently howls like a wolf… which is something the Elder’s found quite amusing. However, I also really liked that we got to meet new humans, new packs, new terra indigene because it brought some freshness into the story. It wasn’t just the same people over and over again. We got a change of scenery between towns, perspectives, and it really made you care for the other characters who weren’t at Lakeside. I could go on and on about this one. It had everything that I loved from the previous books and yet it still managed to kick it up a notch. There wasn’t really a dull moment here. I mean, this big fight between humans and the terra indigene have been building since the get-go. So, there’s a lot of action, planning and plotting, suspense, and a lot of death. I can’t even tell you how many time my mouth dropped open while reading this. This may be my favorite installment yet. Given everything that takes place in this book, I’m not overly sure what is in store for everyone next. 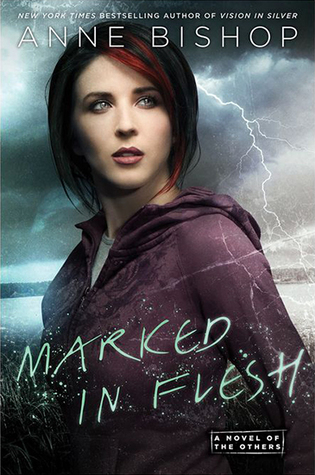 Marked In Flesh was tough for me to get through. I would put the book down for days with no desire to pick it back up. A lot of this book jumps around Namid and shares the lives of the people or Others living there. This bored me I think because none of the main characters from Lakeside were overly involved. Now when the story would go back to Lakeside, I wouldn’t put the book down. I guess for me, the jumping around just dragged on too long and could’ve been summed up a lot quicker. Yes, I saw the importance of why we needed to know about the other areas, but just wish we could’ve got there sooner. Having said that, I never wanted to give up on the series, I need to know what happens next. Fast forward several chapters to when a series of violent attacks take place, things so heinous and wide spread that it catches the attention of the Elders, Namid’s “teeth and claws”. They are never seen but their presence is so strong, you know they are there…watching. When they come into the story, I was hooked all over again and would read until I fell asleep with book in hand. Even though you have no real visual of them, no real description, you just don’t need it to fear them. So after the Elders retaliated in the same manor that the humans attacked the Wolves, they come out from the wild country all over Namid in search for the radical group who started it all. This was pretty cool but also creepy…cool because they showed no mercy, put simply “an eye for an eye”, creepy just to think and know these creatures watched that much to where they could kill the bad and leave the innocent in any area. When they were checking out Lakeside, in the courtyard Meg, Sam and some others were in the Pony Barn hiding when the Elders could be heard outside. Meg starts to howl (Sam, who is a Wolf, joined in) to say, “we are here, keeping watch, we are here”, something the Wolves would do to let the Elders know they were in the area. The Elders found this very amusing, a not wolf howl and became curious of Meg. They ended up looking all around (inside & out) the Liaison’s office, found and ate all the Wolf cookies. I guess even the tough guys go crazy for the cookies. We also got a small glimpse of the Elemental Ocean and the Sharkgard. Again, I am a total shark nerd and would LOVE a Sharkgard spin off series, I think that would be amazing! Now that the Elders are more involved, rules have become much stricter and fully enforced. Travel has limits, communication (phone and email) almost nonexistent and it’s no longer safe in the dark. I so can not wait to dive into Etched In Bone! A conversation between a shark and vampire. That was pretty much what my sister thought. LoL I remember being on the phone with her when she finished it. There’s supposed to be a spin off, but it won’t be the same. I honestly don’t think I will read it. I thought it was great to get all the new characters in. My sister felt the opposite though. Ha! Oh I cannot wait to continue this series. I’m a bit behind but now I’m so curious about the Elders! Brilly dual reviews! Oh. The Elders are the best thing in the whole series. At first I thought it was the elementals but the Elders take the cake. It can be really refreshing to read a story that doesn’t have any dull moments. I would like to read these books one day, I just need to be in the right mood. I won’t lie, they are a bit hard to pick up, even when you are in the middle of the series. They’re just so big and they contain so much world building. In the end though, I felt more connected with the characters because of it all. I hope you get the chance to read these and enjoy them. I love seeing two perspectives of the same book and I couldn’t help but laugh half the time. Enjoyed the great reviews. I hope you get your hands on a copy soon, Silvia. I really enjoyed this series as a whole, and I’m not normally a series person. I absolutely adore this series and am so sad it is over but I’m so looking forward to the spin off. I’m hoping like heck we will still see glimpses of Vlad, Meg, Simon and the whole group. I do, too. I honestly don’t know if I will read the spin-off unless the Lakeside group is in there. I’ve just invested too much time with them. Ee! I do need to start this series for sure.